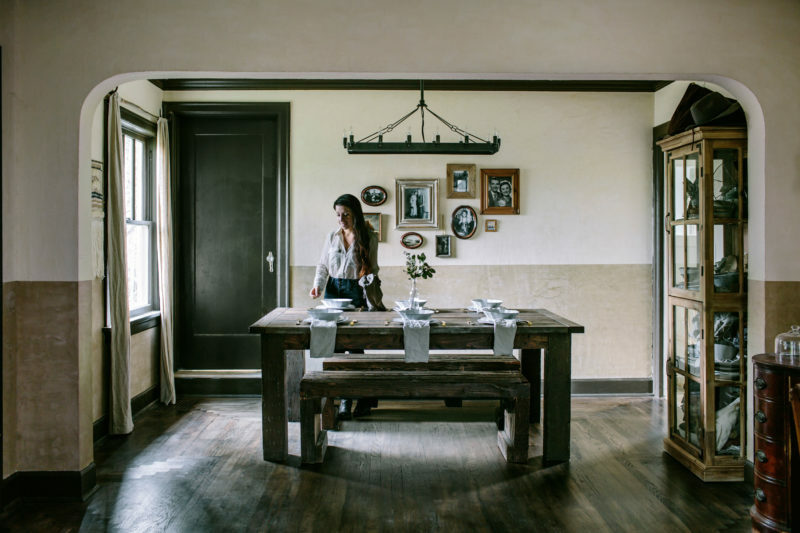 Inside her 1910 farmhouse in California’s Santa Cruz Mountains, Suna Lock, owner of Stripe Design Group and Stripe shops, turns a blank space on its head by dodging conventional sets of framed images in favor of easy-to-source, 3-D gatherings that don’t break the bank. “The context for me is nostalgia,” says Lock, who ­assembles old portraits and vintage art alongside ­curiosities such as antique skeleton keys, hard-edged salvaged machinery, and whimsical feathers. “The mixture of paintings, photographs, and found ­objects is ­important to keeping the composition interesting.” To curate a cohesive look, start by identifying a few favorite items and then build a collection around that aesthetic, whether by ­color or genre. Here she shares her tips for pulling off a ­picture-perfect ensemble with heart. Establish a canvas. Using painter’s tape, frame a space on a blank wall to ­design within. Start designing. To compose your ­collection, set out groups of items in small sections on a floor or table, beginning in the corners with pieces that have a square edge. Hang it up. Lock passes over new nails in ­favor of the rusty ­variety, the kind she can buy in a jar for a couple of bucks at a garage sale. The patina of old nails feels less conspicuous when hanging weathered pieces, she says. Photo finish. Need to make an ­adjustment? Dab a bit of spackle over nail holes with a fingertip. Once dry, touch up with a small painter’s brush. When your look is complete, remove the painter’s tape. 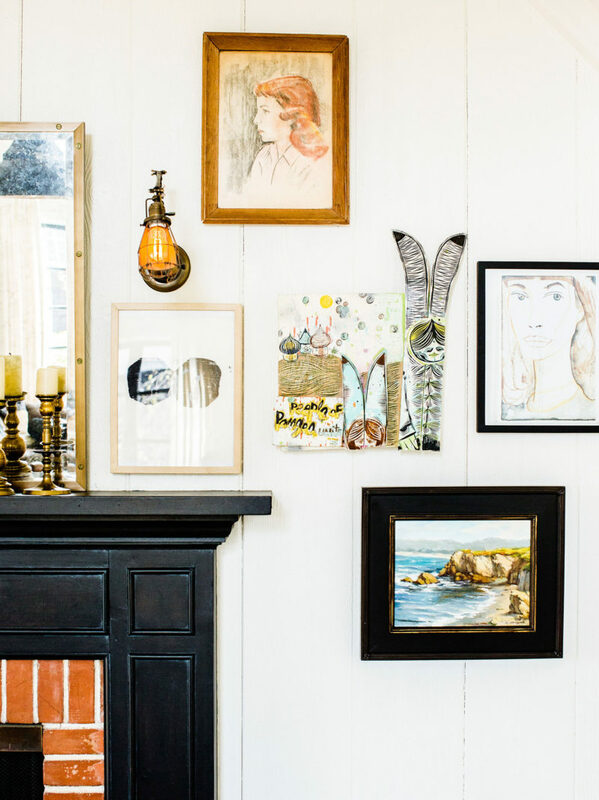 Keep scrolling for more great gallery wall inspo. This statement wall masterfully places frames on similar vertical and horizontal axes, which is soothing to the eye when taking in all the visually-arresting works. We love the many homages to the ocean, too, a fitting motif for a beach cottage or seaside home. 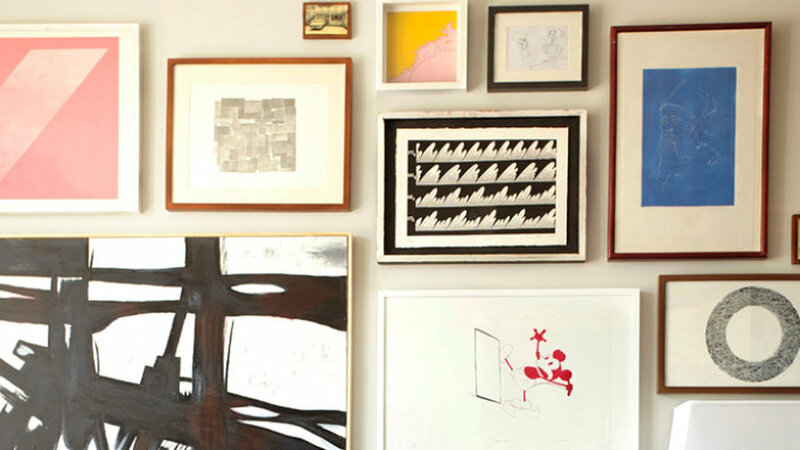 A mixed-media gallery wall makes a big impact, especially when sticking to a neutral palette. The use of color isn't missed when so many points of interest work together without being chaotic. Do you have a prolific artist in the family? 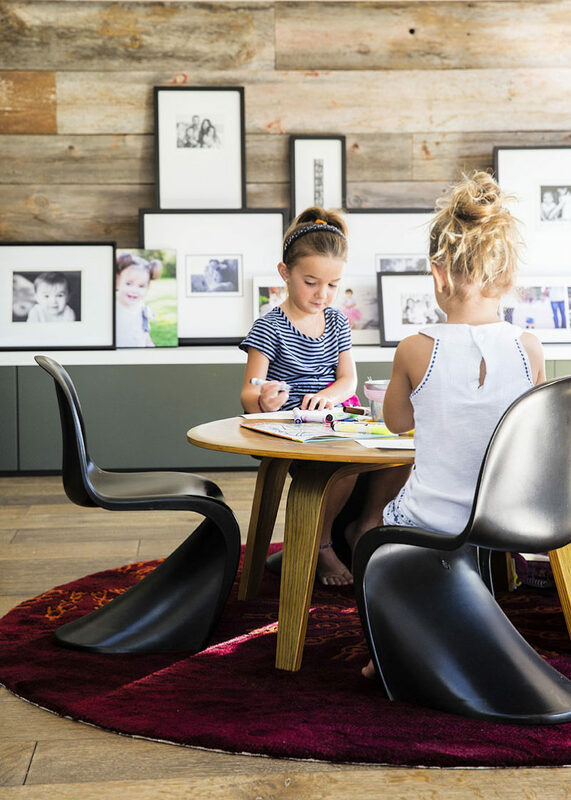 Honor your little one's talent by framing a few choice works and hanging them as a gallery wall in his or her room, or in a more common space in the home. 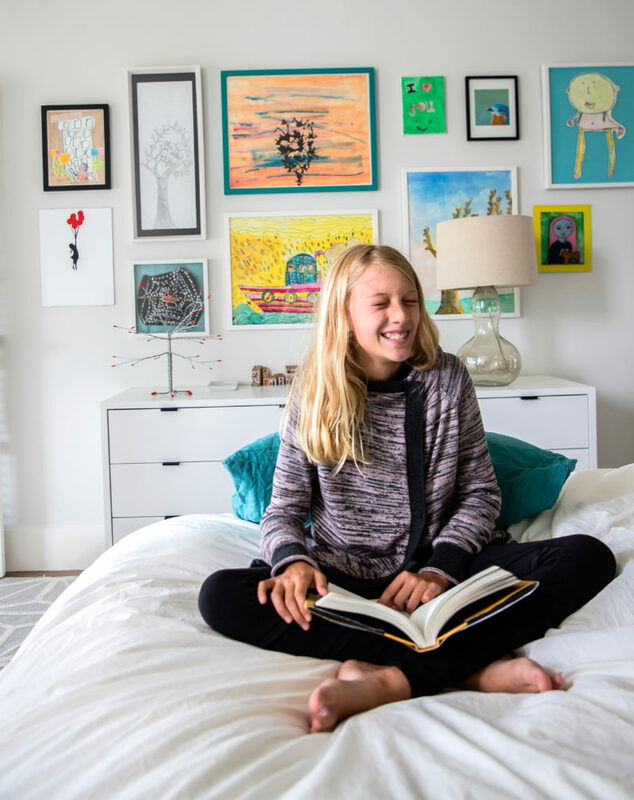 Not only will this beam your pride and joy loud and clear to your kiddo, but also it serves as a clear means of decluttering accumulating artwork. 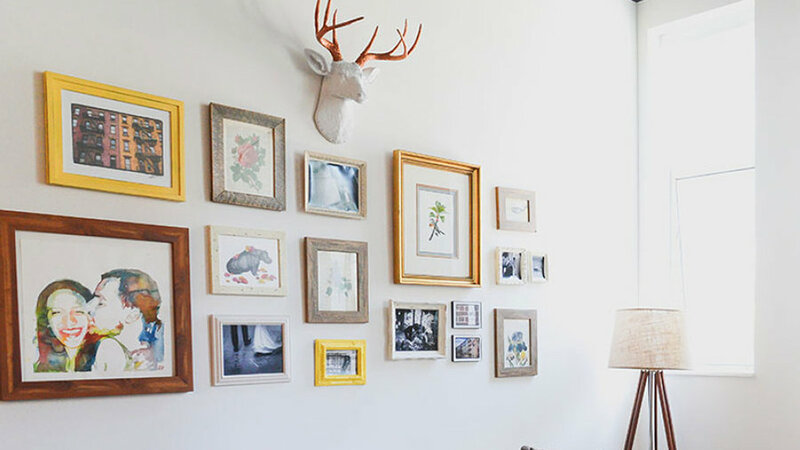 Reimagine the family photo album as a gallery wall. Framing your favorite portraits of loved ones gives them a special place of honor in your home, and if you have black-and-white photos, it adds a vintage vibe to boot. 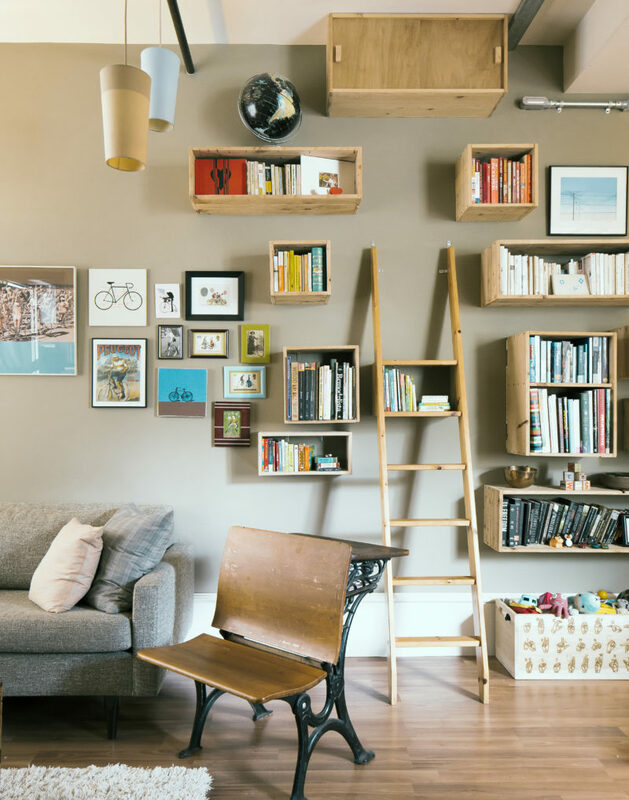 This small living room's wall is enlivened by DIY crates that act as floating shelves housing books. Placed alongside framed art, the look elevates a personal library to a gallery-worthy affair. 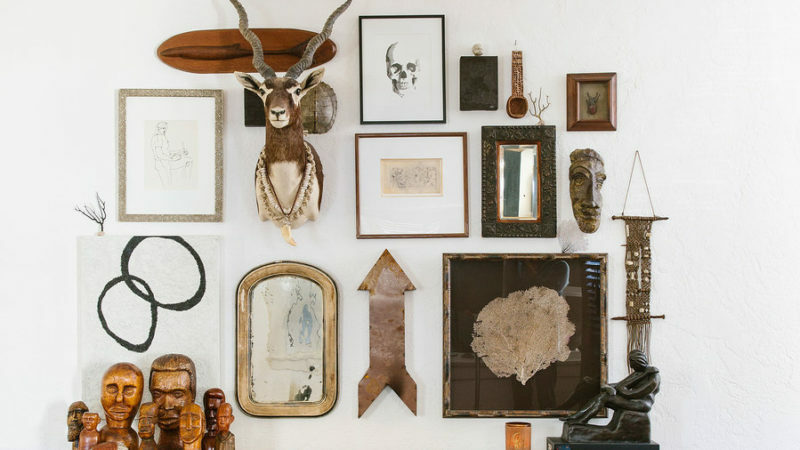 This gallery wall cleverly builds on a couple anchoring statement pieces. The rest remain in a similar palette, which makes the aesthetic cohesive. A grouping of pieces, all framed in a minimalist style, creates a unifying look that works wonders in a small space. 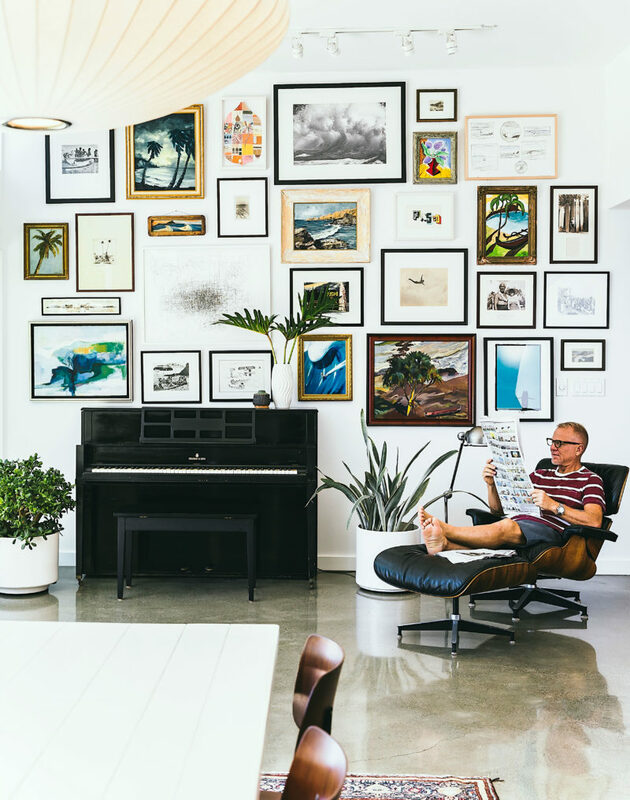 Grouping different styles of art together in a gallery wall gives your space an offbeat vibe, in a good way. 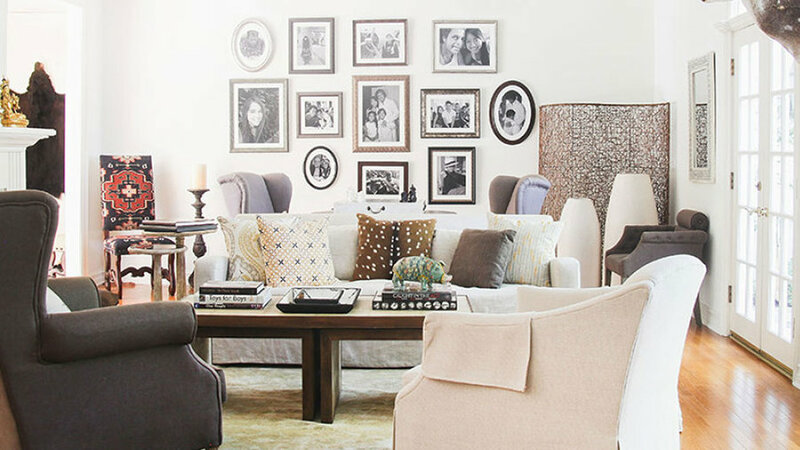 Stick to a unifying palette or similar frames to keep the look somewhat cohesive. 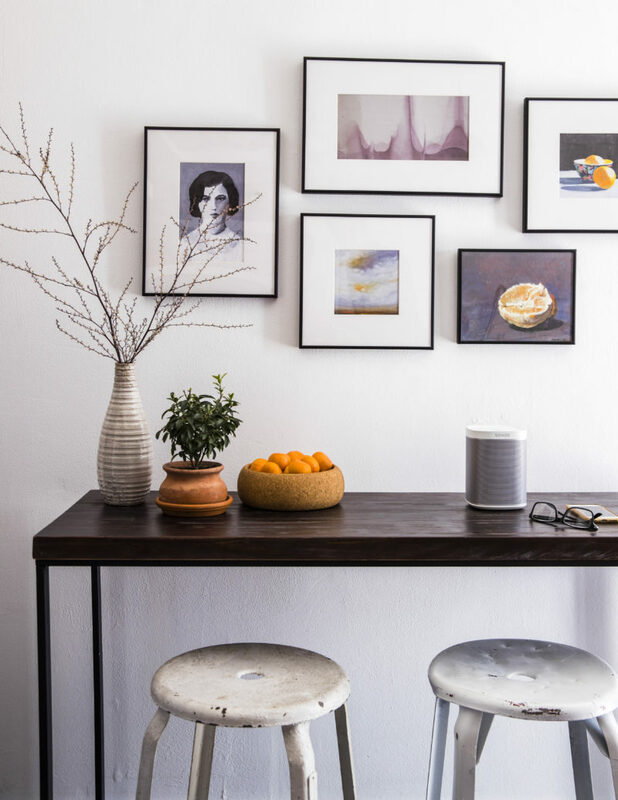 Rather than hang your family photos, try this fresh take on the gallery wall format: Lean them on a low shelf where they’re easy to switch out as their subjects grow. The key to this casual look is different size frames overlapping one another. 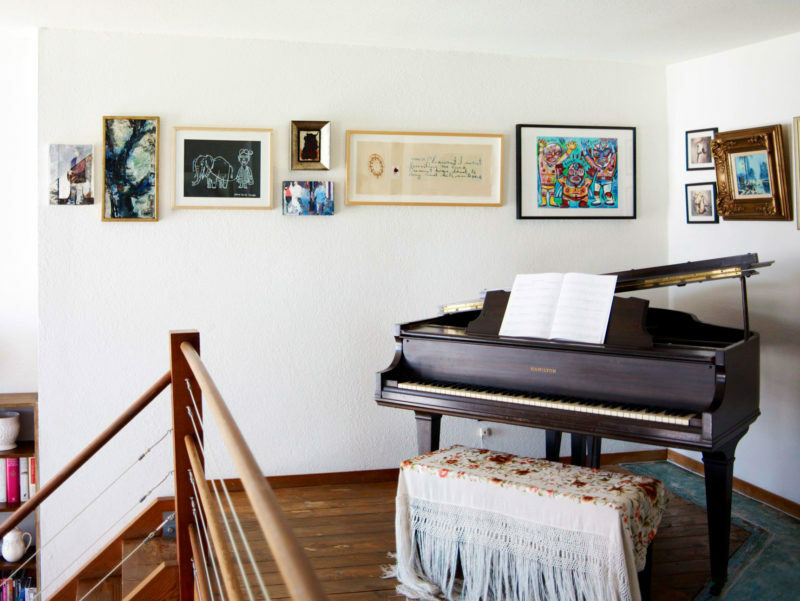 Keeping all art aligned on one horizontal plane gives the eye an easy place to scan, a clever solution for a small space such as this landing that houses a piano and nothing more. 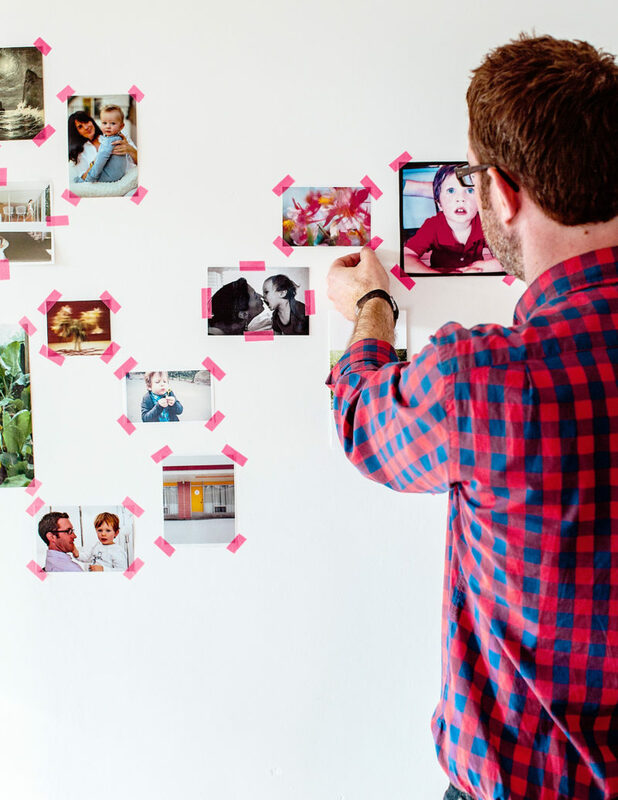 We’re all for carefully-plotted gallery walls, but using washi tape to append snapshots in a casual way gives you freedom to remove and rearrange your photos with zero fuss. Perfect for rentals and kids' rooms, you can customize the look with different colors and patterns of tape. The bright accent wall in this small living room gives the space instant character. 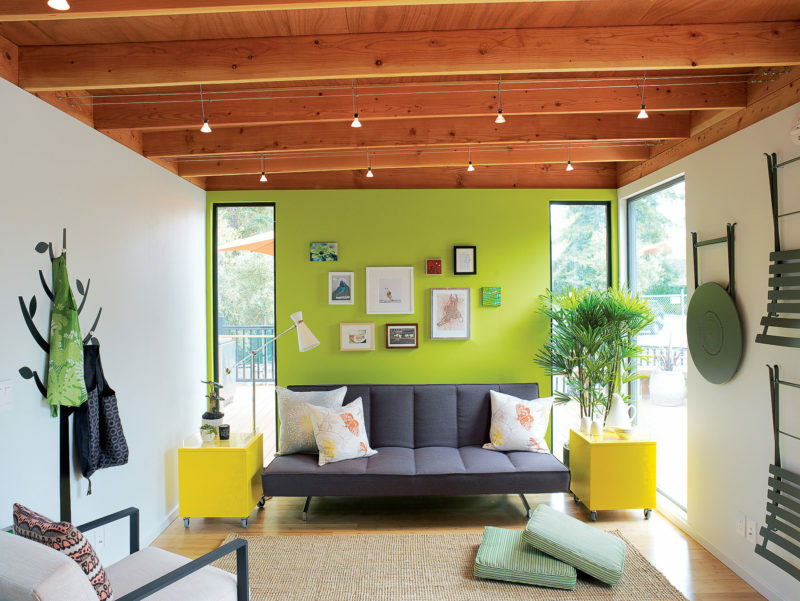 The gallery wall arrangement of small works of art breaks up the vivid green hue in a pleasing way. 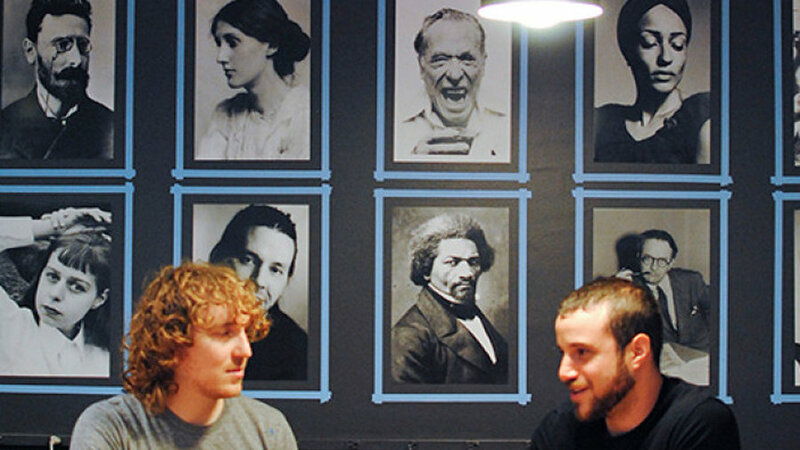 A varied collection of art has more impact when grouped together. Instead of painting an accent wall, create a quilt of artwork and hang the pieces from the ceiling to the baseboard. The look is pure drama. 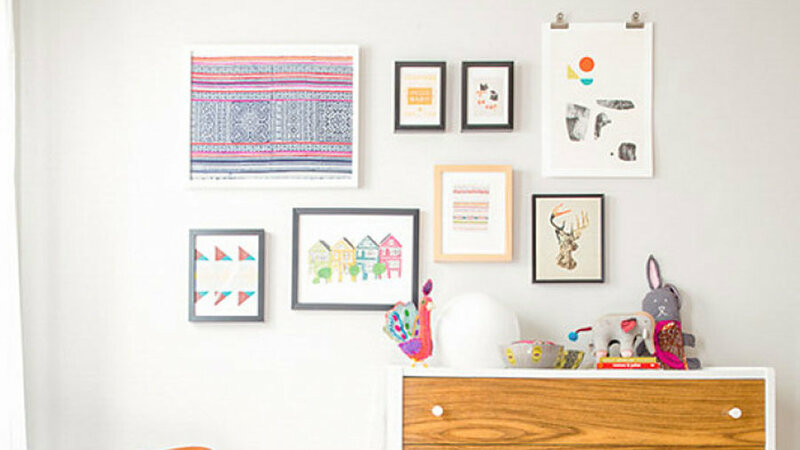 Why confine a gallery wall to your interior space? 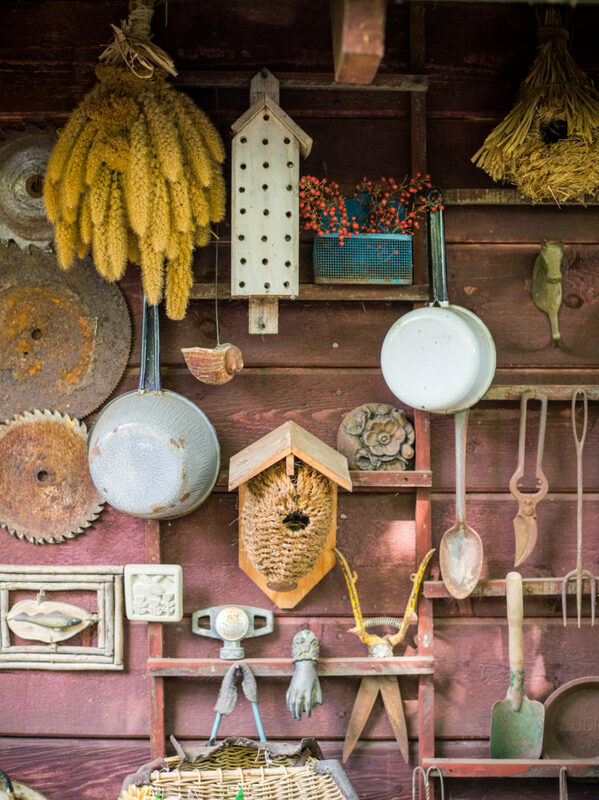 A garden shed wall is just as easily a blank canvas, with tools, baskets, garden accessories, and dried plants acting as works of art. Adding in pottery or wind chimes here and there helps build the gallery wall vibe. 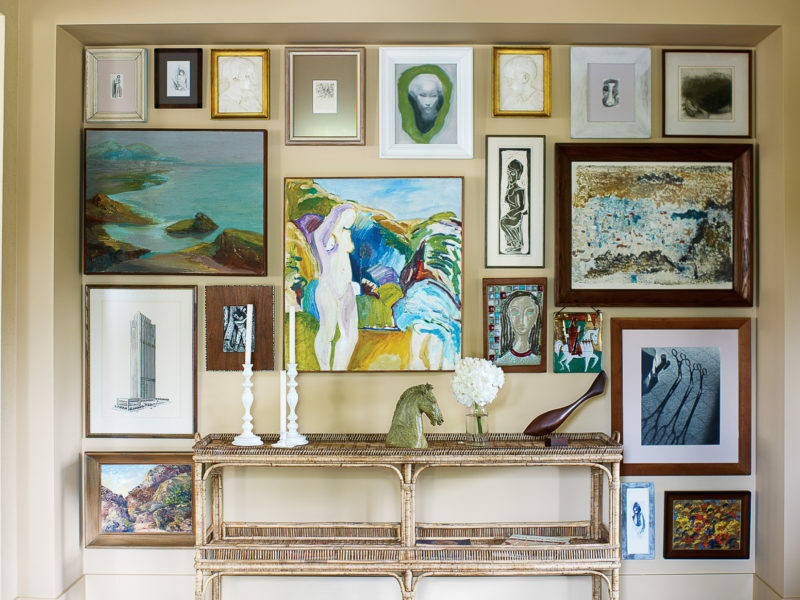 A gallery wall is a great way to display an art collection, and there are a number of ways to go about it, ranging from eclectic to sticking with a streamlined color palette. Here you'll find inspiration from walls styled by designers. provides beautiful interior design by the hour with over 450 interior designers nationally. 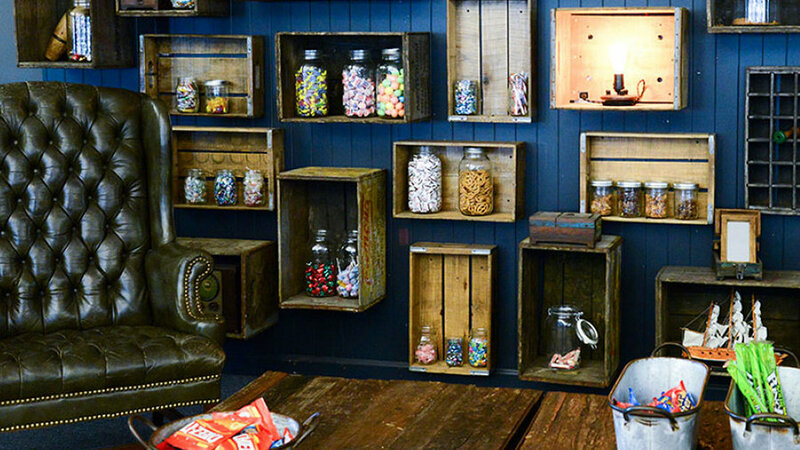 In one of our favorite commercial spaces, wooden crates are mounted floor-to-ceiling for beautiful visual impact and—wait for it—snacks! Useful as clothing displays as well, crates are a great, inexpensive, and easy-to-use wall hanging. 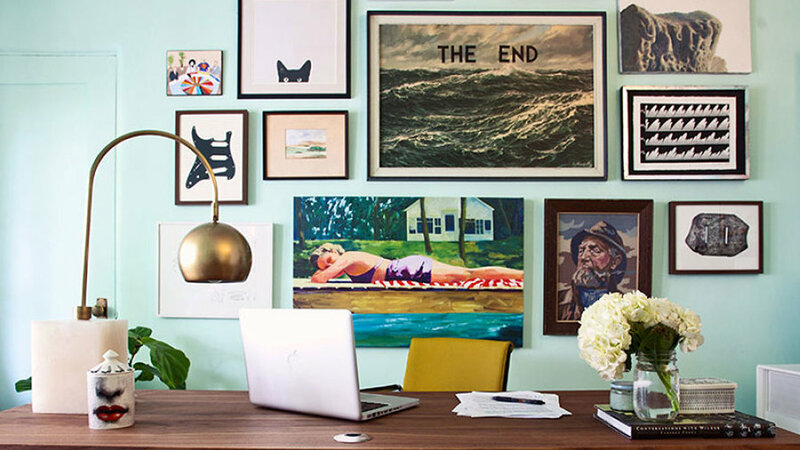 Perfectly playful and smart, the aqua wall in this home office provides the perfect backdrop for an irreverent art collection. 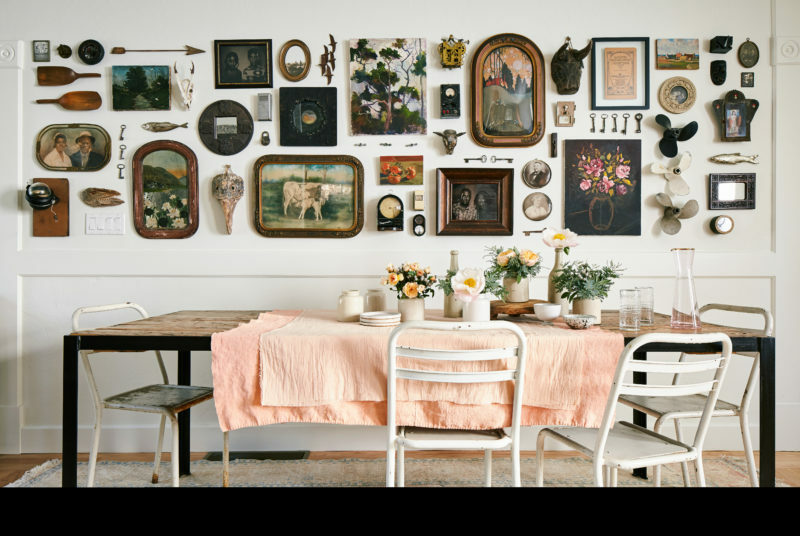 Made up of found vintage objects, this gallery wall is contained to a fixed rectangular space—a smart approach to keeping a mishmash of items from feeling messy. Here, a grid of six images from the same artist matches the client's clean, modern aesthetic. Note how this arrangement makes full use of the wall, meeting the lines of the top of the sofa back. 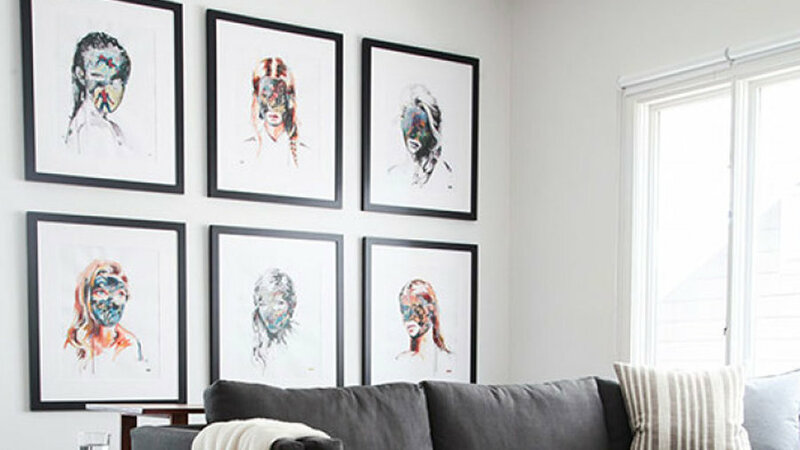 Don't have (or want) an art collection extensive enough for a gallery wall? Use mirrors! This collection of vintage mirrors is softened with the use of two round pieces. 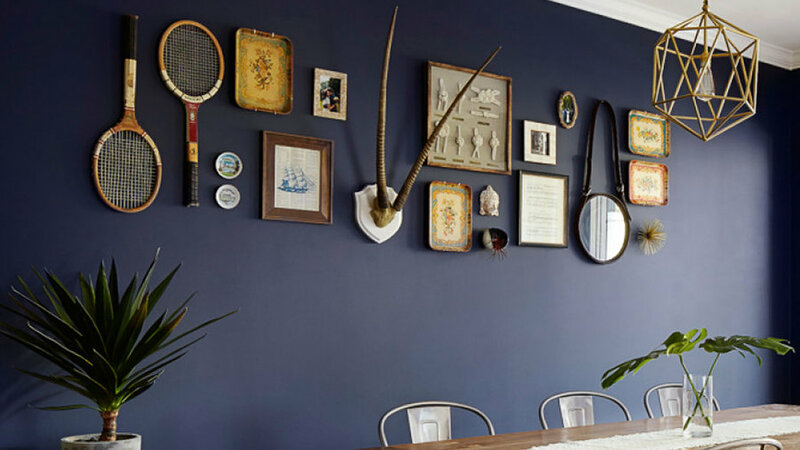 This nursery gallery wall extends the room's color palette onto a plain wall. Hanging some pieces by clips instead of in a frame is a nice, different detail. 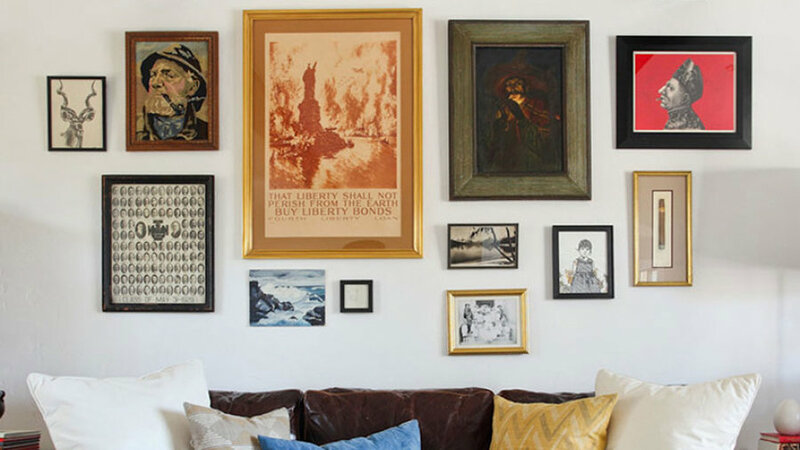 This gallery wall made use of the couple's existing art and photos for an eye-catching living room display. 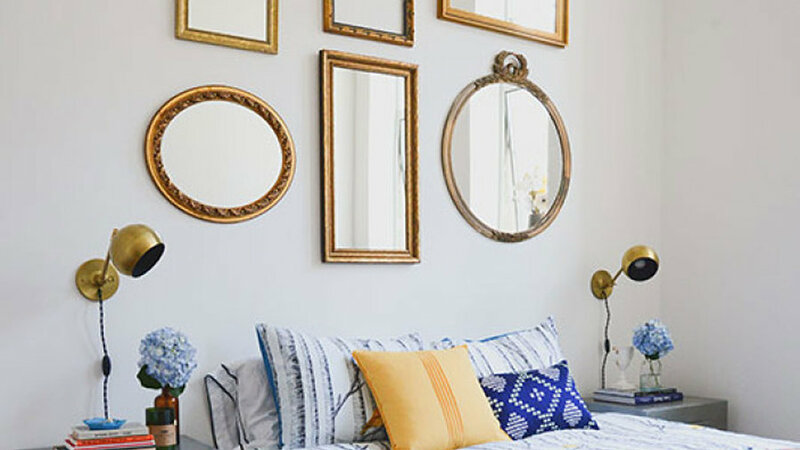 The yellow and gold tones in the frame collection are mirrored in other parts of the apartment. Hanging bigger items in the middle of your gallery wall and filling the outer edges with smaller frames makes for a starburst effect. Very pretty. Rectangular, circular, squarish: you choose the overall shape. 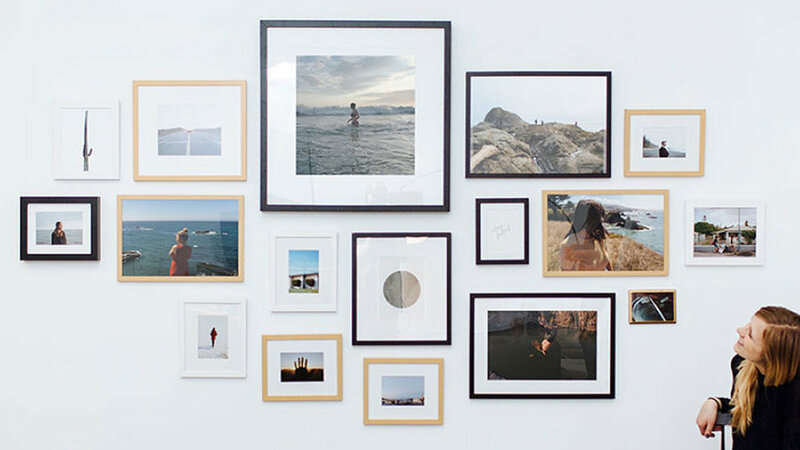 These frames are all from - a full-service framing startup that makes gallery walls a lot easier to hang at home. This graphic art collection has a distinct feel of being thoughtfully collected over time. The bold black-and-white pieces match the pillow and rug, and pops of color add life to the room. Note how the art is grouped around the sofa and lamp. Family photos printed in black-and-white lends an authentic and personal touch that compliments the neutral color palette. Frames are expensive but tape is cheap! Playful tape will make for a fun composition. 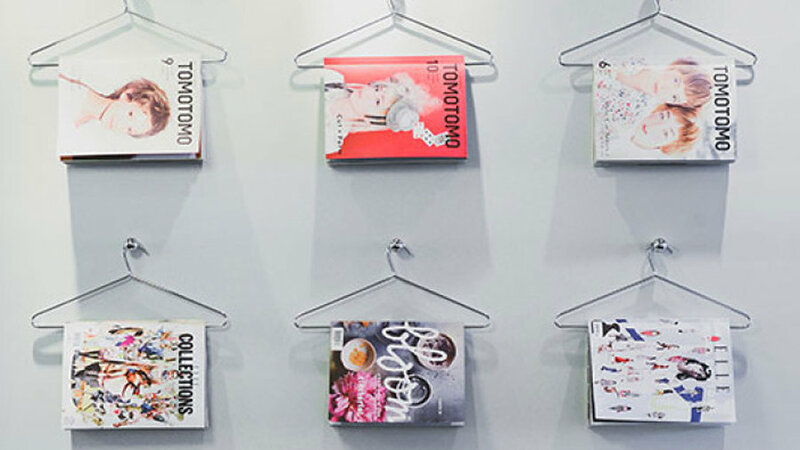 We love this clever magazine display. It's creative and a great alternative to a stack of business press on a coffee table. Magazines are easy to access and change out, their covers make for ever-changing art and the grid maintains order.